Chase is a German shepherd dog with a brown body and lighter brown face and paws. He has large, glittery gold button eyes and a black button nose. Chase wears a blue hat with a paw on the front and a blue jacket and a badge in the centre. Chase was released in January 2017. 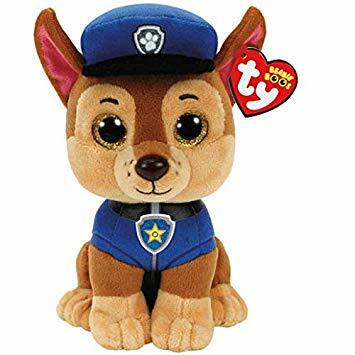 He is based on the character from the popular children’s TV series, Paw Patrol. There are four versions of Chase. This small 6″ Beanie Boo, a medium 9″ Beanie Boo Buddy, an extra large 12″ version and a key clip.